Ernie Rogers was born and raised in Gallup, New Mexico. He graduated from Howard Payne College in Brownwood, Texas with a Bachelors of Business Administration Degree in 1971, and later earned a Masters Degree in Management from Salva Regina College, Newport, Rhode Island, and a Masters Degree in International Affairs from the Naval War College. Following undergraduate study, he was designated a Naval Aviator in June 1972 and reported for duty to NAS Fallon, Nevada. While flying the H-1N helicopter as Search and Rescue (SAR) pilot, he accomplished 32 rescues in the High Sierra Mountains. He subsequently moved to San Diego, California to join HSL-31 and later to Barbers Point, Hawaii to join HSL-37. In May 1978, he reported to Training Squadron Twenty Seven in Corpus Christi, Texas as a flight instructor in the T-28 Trojan Aircraft. While assigned, he served as an aerobatics and formation instructor and was a member of the last cadre of Naval Aviators to instruct in single engine propeller aircraft carrier landing qualification on board the USS Lexington (CVT-16). He was awarded the South Texas Navy League Mark of Distinction Award as the Outstanding Junior Officer for 1979. Following sea tours in the Pacific, Atlantic and Mediterranean he assumed command of HSL-36 in Mayport, Florida. 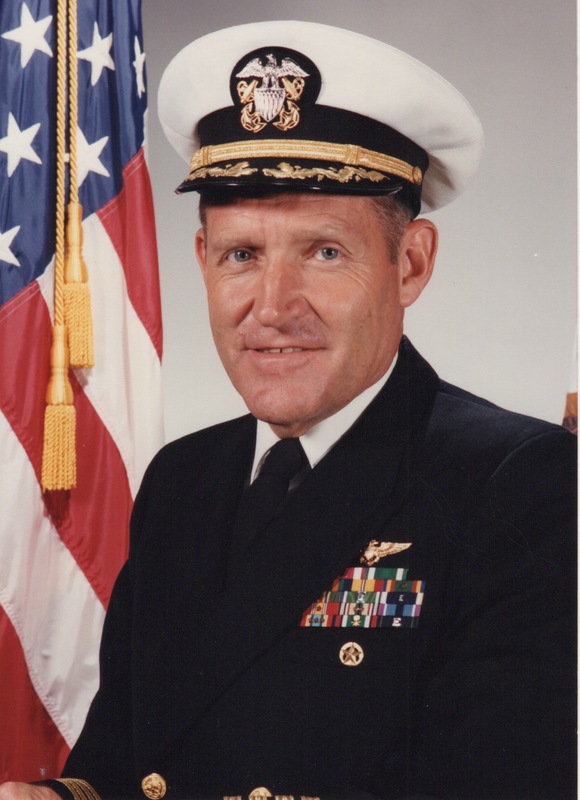 Upon completion of his command tour, he reported to the USS GUAM (LPH-9) as Air Boss. During this tour he participated in the daring night evacuation of the American Embassy in Mogadishu, Somalia. Following that he was deployed to the Persian Gulf in support of OPERATION DESERT STORM. In April 1992, he reported to the Joint Doctrine Center where he served as Director. In August 1996, he reported to the Commander Maritime Defense Zone Atlantic responsible for defense plans for seaports on the Atlantic and Gulf coasts. After 27 years of Naval service, he retired at the rank of Captain and was awarded the Defense Superior Service Medal and Legion of Merit. He joined Liberty University in August 1998 as Executive Director of Enrollment Management, followed by co-founding the School of Aeronautics, which grew from 4 to over 300 students during his tenure. After 18 years he retired from Liberty University. Currently he is volunteer Director of the TRBC Disaster Relief Team which supports disasters though out the United States. He is married to the former Terrye Holly of Artesia, New Mexico. They have two children, daughter Tana and son Ryan, and four grandchildren, Amanda, Lindsey, Sarah, and Bethany Jamison.